NEW YORK, NY (AP).- Irving Penn, whose photographs revealed a taste for stark simplicity whether he was shooting celebrity portraits, fashion, still life or remote places of the world, died Wednesday, October 7, 2009 at his Manhattan home. He was 92. 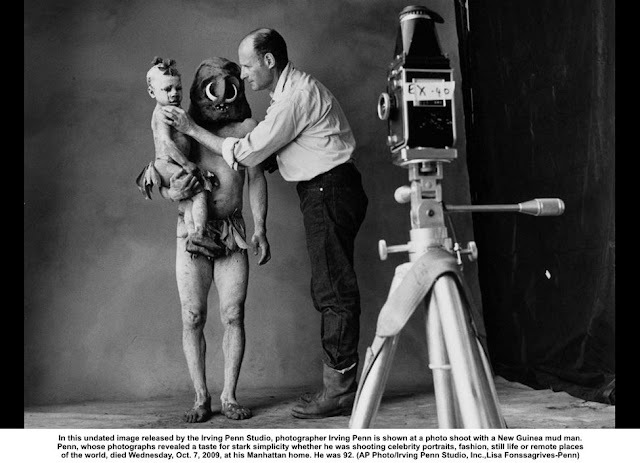 The death was announced by his photo assistant, Roger Krueger. Penn, who constantly explored the photographic medium and its boundaries, typically preferred to isolate his subjects — from fashion models to Aborigine tribesmen — from their natural settings to photograph them in a studio against a stark background. He believed the studio could most closely capture their true natures. Between 1964 and 1971, he completed seven such projects, his subjects ranging from New Guinea mud men to San Francisco hippies. Penn also had a fascination with still life and produced a dramatic range of images that challenged the traditional idea of beauty, giving dignity to such subjects as cigarette butts, decaying fruit and discarded clothing. A 1977 show at the Metropolitan Museum of Art presented prints of trash rescued from Manhattan streets and photographed, lovingly, against plain backgrounds. "Photographing a cake can be art," he said at the 1953 opening of his studio, where he continued to produce commercial and gallery work into the 21st century. Penn's career began in the 1940s as a fashion photographer for Vogue, and he continued to contribute to the magazine for decades thereafter. He stumbled into the job almost by accident, when he abandoned his early ambition to become a painter and took a position as a designer in the magazine's art department in 1943. Staff photographers balked at his unorthodox layout ideas, and a supervisor asked him to photograph a cover design. The resulting image, on the Oct. 1, 1943, cover of Vogue, was a striking still-life showing a brown leather bag, a beige scarf, gloves, oranges and lemons arranged in the shape of a pyramid. More of AP article. . .